BATON ROUGE - State emergency officials warned people in Louisiana about dangerous heat and humidity levels expected to scorch the state this weekend. 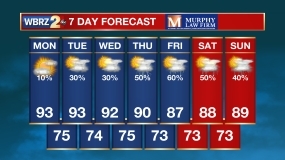 The Governor's Office of Homeland Security and Emergency Preparedness urged people to use caution because of the triple-digit temperatures forecast for Saturday and Sunday. The National Weather Service said some areas could even reach 105 degrees with heat indexes about 110. • Drink plenty of water. Persons who have epilepsy or heart, kidney or liver disease; are on fluid-restricted diets; or have a problem with fluid retention should consult a doctor before increasing liquid intake. • Protect face and head by wearing a wide-brimmed hat. • Check on family, friends and neighbors who do not have air conditioning and who spend much of their time alone. • Avoid strenuous work during the warmest part of the day. Use a buddy system when working in extreme heat and take frequent breaks. Five parishes in north Louisiana are under burn bans as of Friday afternoon due to the hot, dry weather. GOHSEP said excessive heat warnings or heat advisories could be issued as the heat wave continues, and people can keep up with the latest emergency information through the state's free ALERT FM app and their Get A Game Plan website.